My name is Brian Keane and I am the founder of Prodigy Hockey. Through our online and off line programming, we want to give players and coaches the opportunities to realize their potential. We study today’s top players, scientific research and utilize our own experiences to provide our students with the best information possible! Our staff has a true passion for the game of hockey and we are driven to help develop hockey players of all ages and skill levels. At Prodigy, we create an environment for dedicated hockey players to discover their true potential on and off the ice. Our curriculum molds players to be adaptable, intelligent, skilled, and most importantly, people of high character. We use a blend of on ice development, sports psychology, video, and quantitative analysis to track the acquisition of the attributes needed to have success at the highest levels. All of our programming is based on the latest research in skill acquisition and sports science. 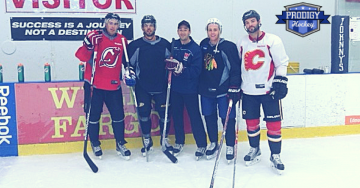 We’re trusted by the NHL’s brightest stars, all the way to beginners.